It’s December again. And in the new merchandise-mad, money-hungry cycle that Lucasfilm’s corporate parent Disney has established, it’s new Star Wars movie time too. May is now Marvel’s month, and that makes me a little sad. Summer was Star Wars season when I was a kid, so I equate that long-stretch of warm weather as the period you escaped the rigid confines of public school and caught up with Luke, Leia, Han, Lando, Darth, and friends, reenacting big screen adventures in the backyard or poolside. Unless we all plan to ride Tauntauns across Hoth’s frozen tundra (#nerdjoke), ain’t too much role play happening in the backyard this holiday season. The latest entry in the series is being dubbed a standalone “Star Wars story” in that it is not tied into any particular trilogy of films. Rogue One fleshes out a throwaway reference in the original 1977 film (now known as A New Hope), explicating how the plans for the original “Death Star” make their way from Imperial architects to the shiny dome of one bee-booping droid R2-D2. It’s a clever (and wisely capitalistic) conceit, and, for the most part, the film satisfies the inquisitive fifth-grader in us all, acting out a scenario many may have tried to imagine 30-some years ago using piles of Kenner action figures. Director Gareth Edwards (Godzilla) and screenwriters Chris Weitz and Tony Gilroy have concocted a blockbuster that is one part The Guns of Navarone with a sprinkling of Saving Private Ryan and one part The Wizard of Oz with a dollop of Little Orphan Annie, blended with a whole heaping helping of deep geek references to the infrastructure and mythology of the original Star Wars films – heavier on the 70s/80s entries, but not entirely neglecting the better parts of thee 90s/00s flicks. Rogue One is a darker journey (in a-not-terribly-shocking SPOILER alert, let’s just say things don’t end particularly well for the new characters), exploring the bowels of the Star Wars universe and setting up the oppressively fascistic milieu of A New Hope, The Empire Strikes Back, and Return of the Jedi. I mean the Rebel Alliance has to rebel against something, right? Much has been made in the news (well, FoxNews … ironic, since Fox used to own the franchise) about the filmmakers’ social media critique of President-elect Donald Trump and of their allusions to the frightening similarities between the fantasy world concocted by George Lucas and the hateful xenophobic power-grabbing of our real-world politicians. Let it be said that there is nothing in this film that satirizes directly the shenanigans of this past fall as we head toward January’s inauguration. How could there be? The film was shot in 2015, with a mountain of special effects to achieve in post-production until now. However, in these fraught days of dubiously motivated cabinet appointees, tumultuous international relations, heartbreaking Middle East conflict, and cyber-attacks of an unprecedented (NOT “unpresidented”) scale, I found it difficult to enjoy the escapist “fun” of a band of scruffy rebels fighting unscrupulous bureaucrats, planet-hopping at a dizzying pace, engaging in bloody street battles across crowded and dusty marketplaces, and hacking into monolithic computer systems to release state secrets. But maybe that’s just me. Rogue One is entertaining and gives us longtime fans a lot of intriguing backstory upon which to chew for months to come. I fear that the casual viewer will find it too talky and somber by half, waiting for the trademark space dogfights to kick in. And they do – the last 45 minutes are a doozy. For us Star Wars nuts, the “palace intrigue” will be a hoot, albeit a bleak hoot, with effective reappearances by Darth Vader (voiced again by James Earl Jones) and Grand Moff Tarkin (creepily CGI-reincarnated Peter Cushing, looking like a refugee from The Polar Express). The series newcomers blend in well, if not leaving any lasting impressions. Felicity Jones, so good in The Theory of Everything, is haunting if a bit dour throughout as protagonist Jyn Erso. She is yet another in the long line of Star Wars orphans, abandoned by parents more invested in political statements than child-rearing; consequently, she has a reason to be rather glum. Like The Force Awakens‘ Rey (Daisy Ridley), she is a welcome addition to a series that hasn’t always celebrated strong, independent, adventuring women. Her father Galen Erso (a soulful Mads Mikkelsen) is the chief designer of the much-vaunted Death Star, and his change of heart puts both him and his family at great peril when he flees the project, hiding out as a moisture farmer on some forgotten planet. (The Roy of 30+ years ago would have been able to remember all of the planets named/visited in Rogue One. Present-day Roy? No clue. Nor do I care.) 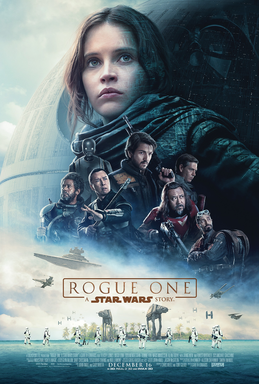 The Empire, led by Orson Krennic (a rather forgettable Ben Mendelsohn in a stiff, starchy, heavily-creased white cape that implies there are neither fashion designers nor irons in space) tracks Galen down and drags him back to work, leaving Jyn effectively orphaned for a really long time. Eventually, the nascent Rebel Alliance seek the adult Jyn out. Jyn is now a felon, living the Lucasfilm equivalent of Orange is the New Black after being raised by cyborg Saw Gerrera (Forest Whitaker in his typical scene-killing-ham mode). You see, the Rebels want Jyn to help them find her pa, get the plans for whatever the Empire is cooking up (“That’s no moon!”), and save the day. 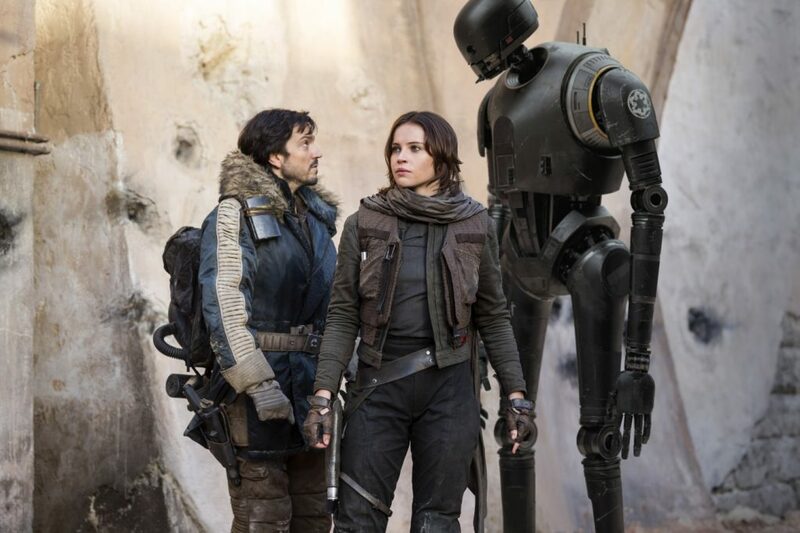 Along the way, Jyn meets cute with Cassian Andor (a pleasant but uncharismatic Diego Luna) and his comically nihilistic robot buddy K-2S0 (voiced delightfully by Alan Tudyk, proving that he is always the MVP of any movie in which he – or his pipes – appear). The trio collect a band of good-hearted and refreshingly diverse misfits (actors Donnie Yen, Riz Ahmed, Jiang Wen – all turning in credible, nuanced character turns) on their way to the inevitable denouement, setting up neatly the opening sequence of A New Hope. Rogue One is stingier with the whimsy than other Star Wars films. 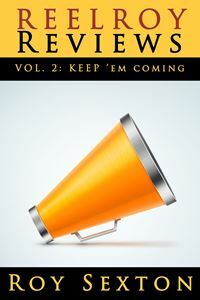 The humor is sardonic, not Saturday Matinee side-splitting. As the Death Star baddies use their new toy for target practice, noble Cassian scans the incoming cloud of debris and destruction and mutters, “There’s a problem on the horizon. … There is no horizon.” It gets a laugh, but not a hearty one. Perhaps, we in the audience are just a bit too worried about our own horizon these days to find the humor any more. Maybe I will go play with my old Kenner toys in the backyard, frostbite be damned. I need the escape. great review, roy. not chomping at the bit to see this one, but may see it later. interesting about there being ‘no horizon’ ahead. dress warm for your snow play out there. finally got here…may the force be with me…wonderful review as usual!!!! haha! indeed!! thanks, and love you!